Though the undeniable beating heart of the jazz combo, the bass rarely takes center stage. 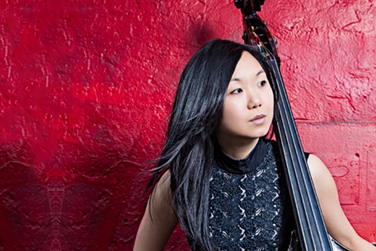 In this performance, Linda Oh showcases the instrument’s funky, soulful potential. Born in Malaysia and raised in Australia, Oh racked up young performer awards while in school. She is a double bassist, electric bassist and composer, creating music for various ensembles and short films. She has performed the musicians such as Joe Lovano, Steve Wilson, Vijay Iyer, Dave Douglas, Kenny Barron, Geri Allen, Fabian Almazan and Terri Lyne Carrington. Linda May Han Oh 4tet: NYC Winter Jazz Fest 2015 "Lucid Lullaby"
Linda May Han Oh, and Fabian Almazan are active environmentalists. Almazan is the founder of Biophilia Records, which promotes environmental awareness and sustainability. The two also liaise with environmental and educational organizations such as BioBus, Girls Club of America, Trees NY, Riverkeeper, and InspireCorps. They believe that all artists have mandates which adhere to certain practices to limit their carbon footprint. Almazan created an alternative to plastic CD packaging, The Biopholio™. This plastic-free, origami-inspired medium, bursting with vibrant artwork and liner notes, is made of FSC-certified paper, hand-folded and printed using plant-based inks. Each contains a code for the listener to digitally download the music in his or her preferred format.